What does tE mean on an LG washer? There are a few different reasons why the tE error code can display on your LG washing machine. LG washer getting the tE error code? The tE error code on your LG washing machine display is an indication of a HEATING SENSOR ERROR. The 2 parts that may be faulty and cause the tE fault code is either a bad DRUM THERMISTOR or the HEATING ELEMENT. These 2 issues can cause your LG washer to display the error code tE. Checking, Repairing, Cleaning, or Replacing the 2 components will clear the error and fix your LG washing machine. LG Front Load Washing Machine tE Error Code indicates a HEATING SENSOR ERROR. 1 – Remove the Washing Machine from Power for 30 Seconds. 2 – Resupply Power to the LG Washing Machine and Press the POWER BUTTON. 3 – Press the SPIN SPEED button until “NO SPIN” is highlighted. 4 – When the Washer has Fully Drained out the Water – Restart the Washing Cycle. 1 – The DRUM THERMISTOR IS FAULTY or has LOOSE WIRING. 2 – The HEATING ELEMENT IS FAULTY or has LOOSE WIRES. 1 – Unplug the LG Washing Machine From Power. 3 – Reconnect The Wires Going To and From The Drum Thermistor If Loose. 1 – Check the Resistance of the Drum Thermistor using a Multi-Meter/Ohms Meter. 2 – The Resistance Will Measure About 40000 Ohms at 85F. 3 – If the Resistance Is Not 40000 Ohms then the Drum Thermistor is Faulty and needs to be Replaced. 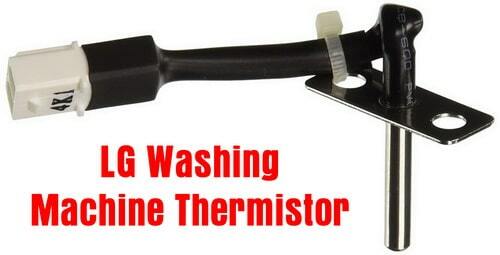 1 – Check LG Washing Machine Heating Element for Damage, Defects or Loose Wiring. 2 – Check the Heating Element With a Multi-Meter to be sure it is in Working Order. 3 – If You Find The Heating Element To Be Faulty It Will Need To Be Removed and Replaced. NOTE: If the Drum Thermistor and the Heating Element are in working order – The tE Error Code SHOULD NOT SHOW. If Both Parts Are Secure, In Working Order, and have NO Loose Wiring, the tE error Should Not Appear on the Display of your LG Washing Machine. PARTS NEEDED TO FIX REPAIR AND CLEAR THE tE ERROR CODE is either the Drum Thermistor or the Heating Element. 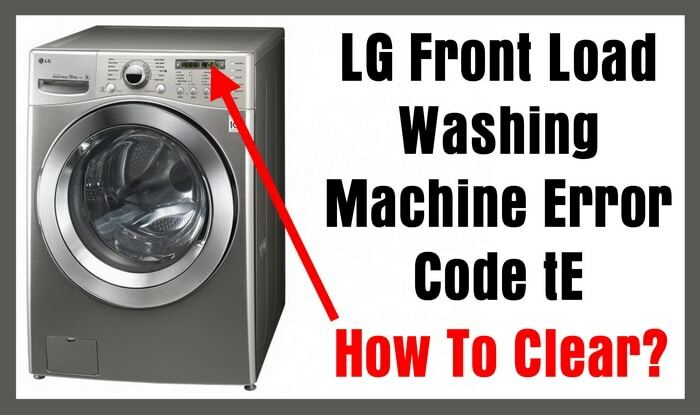 Need help fixing your LG washing machine with the tE error code? Please leave your question below and we will assist you in repairing your washer and clearing the tE error code. I have an LG WM2650HRA washing machine that is showing a te error code. I replaced both the thermistor and heating element but the te code still shows. Tried unplugging for at least 30 seconds but te still shows. What are my options? Pull the element and thermistor back out and test? Should there be water in around the thermistor and element before turning on? I am having difficulty finding a Tub Thermistor for my LG Washer Model WM2501HWA. I have already replaced the heating element and it still displays the TE error. Hi there, I can’t find any information on a thermistor for WM2301HR… Is that a standard one for all LG Front Load washers? On the bottom you spoke about another heating sensor . What is the oms? Next post: Refrigerator Has Odor Inside – Does My Fridge Have A Dirty Air Filter?